Purpose: to make as meaningful as possible this life that has been bestowed upon us, to live in such a way that we may be proud of ourselves, to act in such a way that some part of us lives on. Kigali is a city set among gently rolling hills that bask in the equatorial sun by day and sparkle with a generous scattering of electric lights by night. Women in traditional brightly colored dress carry baskets of bananas and other fruits and vegetables gracefully balanced on their heads. Men balance heavy sacks of beans, potatoes, refuse and wood upon their heads and shoulders as they nimbly make their way through traffic and up and down hills. Horns honk as skilled drivers somehow avoid hitting pedestrians, taxis, buses, motorcycle taxis and each other. Outwardly peace reigns in a land just thirteen years ago devastated by a genocide in which over eight hundred thousand men, women and children lost their lives within a four month time span. Inwardly there continues to be much suffering. Those who can remember the genocide horrors of 1996 and the genocides of years- prior cannot easily forget. There is no one in Rwanda whose life has not been touched and forever changed by these events. It’s difficult to imagine. It is difficult to imagine because we have been sheltered from such tragedies and although we hear the stories it seems surreal. We try our best to imagine what it would be like and try to put ourselves in their place. It is difficult to imagine because there is an aura of peace and people of all ethnic groups are mingling once again despite the memories that haunt them from within. We have come as much to drink in the sights and sounds and beauty that is Rwanda as to help alleviate the unspoken inner sorrows of those whose lives we may be graced to touch. As for some of us, Paul Oas, Dottie Webster, Caroline Sakai and myself and our all-around man Tim Botsko from Paul’s Church, this is not our first trip to this part of Africa and we already know what the other nine members of the team will soon find out. What we five already know is that Rwanda will give us back more than we will ever be able to give. It is time to leave and I leave the guesthouse that has been my home for over two weeks in the early morning darkness. Caroline and Dottie have left earlier in the week and the rest of the group will leave later this morning. I am driven to the airport in a taxi and accompanied by a man known as Safari whose name is Jean Damascene. He has been an invaluable friend and coordinator for us all and we hug good-bye. As I go through the security gate, the guard asks the purpose of my trip. I have been trained to say “tourist” but I have filled out a departure card and list my occupation as Social Worker. I can’t resist the temptation to say “And I’ve done a little volunteer social work while I’m here also.” He looks me in the eye and quietly says, “We appreciate your services.” It’s nice to hear and I feel good inside. Mother Theresa once said, “I know that what I do is only a small drop in the ocean but it is a drop.” We hope we have added a few drops to the good work that is occurring throughout Rwanda. We have accomplished a lot for the short time we’ve been here. Jim Hall, a dentist accompanying our team from San Diego, has examined the teeth of 400 orphans and taken those most in need to a local dentist who will continue to follow up with the children of El Shaddai. Paul’s church, Christ Lutheran in San Diego, California, has agreed to pick up the continuing expenses. Jim has taught the children the importance of brushing their teeth. He has let them know how important their teeth are and how important they are. Jim wonders what place the children who sleep four and six to a bed will find to keep their toothbrushes. But the children will have a place to brush their teeth and to wash their hands. Our wonderful health team has paid a carpenter to build a washstand and they have placed a jerry- can with a spiget on it. Now hands can be washed after using the latrine and before eating. The really good news, as if all that wasn’t enough, is that the children now have, for the first time, safe water. Paul Oas and Jim Hall were able to arrange for an up- to date water purification system to be installed where none has been before. This will undoubtedly cut down on the diseases that plague the children. Miraculously, this water system was donated and installed free of charge. Whitney Woodruff, a Nurse Practitioner and her two fellow nurses, Joanna Ransier and Kelli Barber (travel expenses Funded ATFT Foundation) have done the impossible. They stayed up to the wee hours of the night creating medical charts for all of the children and took those most in need to see a local doctor. The kindly local 7th Day Adventist doctor will be following up with the children’s medical needs and even visiting the children at the orphanage on a weekly basis. The nurses identified cases of typhoid and malaria and, most dramatically, saved the sight in one young boy’s eye. The boy, J., had been poked in the eye with a stick a month before our arrival. He had received no medical attention and one eye was oozing pus and the other in immediate danger. Antibiotics were able to stop the infection and prevent blindness in the one eye although it was too late to save the other. The self-help quilting project first conceived by Dottie Webster and me was off to an impressive start. A quilting instructor, Daisy Gale from Utah, accompanied our team and I brought six sample quilts created by the Red Rock Quilters of Sedona. The Sedona women are fabulous quilters and the stunning quilts they provided were created entirely of African fabric brought back to the States last year by Dottie and myself. The sample quilts were a hit with everyone and the children, with Daisy’s help, created their first quilted wall hanging. Dottie and I have been able to sell the first quilted wall hanging for $400.00. This money has been sent back to the orphanage. 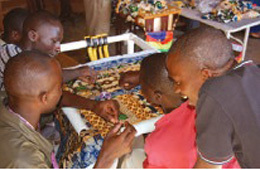 The proceeds from the sale of the quilt will go back to the school quilters, older boys who need a way to make a living once they leave the orphanage, and one half of the proceeds will go to the orphanage itself. Dottie and David Webster have hired and are paying the salary of a business manager for the quilting project and a local sewing teacher has been hired to teach quilting. My husband and I have agreed to pay the salary of the quilting teacher. Dottie Webster worked day and night before our arrival in Kigali, doing the necessary paperwork to submit a grant application for this self-help project to the American Embassy. Paul, Dottie and I met with the United States of America Ambassador to Rwanda, Michael R. Arietti, for about an hour and had a nice chat and plugged the self-help quilting project. We look forward to the project growing to eventually include more children. Caroline Sakai led our team in the one-year follow up to the TFT research that was begun a year ago. We also offered to treat the children for any problems, which hadn’t been resolved during their prior treatments, or for any new problems that had arisen since we had last been there. Alas, most children had only health problems that needed to be addressed by our medical team. When it came to emotional problems they collectively reported no more “bad dreams during the day”(AKA flash Backs), no more nightmares, fewer bed wetting incidents, less anger, fewer headaches, increased ability to concentrate, improved ability and confidence to mingle with others, less shyness and more self esteem. Many said they had no problems at the moment but when problems did come up they did the tapping. Thanks to Roger Callahan for this gift and thanks to The ATFT Foundation for making this trip possible. We were also able to treat several new children who hadn’t received the benefits of TFT during last year’s visit to El Shaddai. American TFT’ers with teachers also trained in TFT. Left to right middle row: Suzanne, John, Dottie, Sandrine, Rose, and Caroline. Back row: Interpreters, Billie and Marcelle. Front row: Head teacher Julienne and Sylvestre Caroline and Dottie, two outstanding trainers and therapists, and three interpreters assisted me, as we trained 52 people in our first two-day algorithm training during this mission. Meeting Rooms, supplies, transportation and lodging were all paid for with contributions from the ATFT Foundation. Several of our new trainees held government positions relative to the treatment of trauma. ABATONI Jane GATETE, the executive Secretary of Association Rwandaise des Consiillers en Traumatisme with the Ministry of Health, had us over to their new counseling facility following the training. She expressed interest in us training even more therapists in Rwanda next year, perhaps at their impressive and expansive new facility. The day after the algorithm training we facilitated a review training, attended by 20 of last years 33 trainees. Attendees came for the review training from throughout Rwanda and the Democratic Republic of the Congo. They were an enthusiastic group and shared success stories of using TFT with others and themselves. This group also attended compliments of the ATFT Foundation. The next week was lonely without Dottie and Caroline. I did an impromptu one-day introduction to TFT training for a group of Christian Women Counselors, Women’s Foundation Ministries that constitute the most utilized therapy group in Rwanda. They were an impressive group of women with a strong women’s rights agenda. Their goals according to their brochure included, “…to be good leaders for the Nation and not be leaders in the “Kitchen.” Their motto is Faith in Action and the leader of the group and some other women present had recently returned from Darfur where a group of Protestant women and a group of Catholic Women had gone to treat Muslim women for war related trauma. The women were impressed with the dramatic results achieved in such a short time and want to find a way to have more training. Their own life stories were often heart wrenching but it was a privilege to have been a part of their healing through Thought Field Therapy. 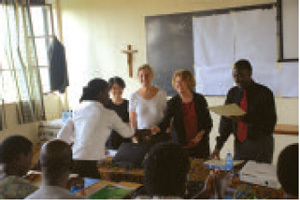 The next day was a two-day training sponsored jointly by US Aid, Catholic Relief Services (CRS) and the ATFT Foundation. US Aid is working with established groups such as CRS, CARE, and World Relief that have proven over time to be effective and efficient in delivering social services in Third World Countries. This training was attended by 29 social workers, nuns, brothers and lay persons who work with street children. The head of CRS in Rwanda, Sean T. Gallagher, gave an opening speech and Pascasie Musabyemungu, safety net coordinator, gave a warm welcome. Gabriel Constans assisted me in this training and was especially valuable with his help during the small group practices. This group provided a meeting room, audiovisual equipment, meals, transportation and even lodging for those who came from far away. ATFT paid for the manuals and the interpreters. 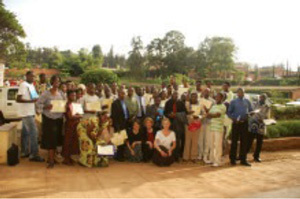 The twenty nine attendees all work with the 24 CRS safety net centers for street children located throughout Rwanda. I adopted this training and the others to include new information on what children who have been traumatized need in order to recover from trauma. The day after the CRS training I was picked up by Pascasie and we visited two orphanages that also take in street children. The first orphanage I visited was an orphanage financed and run by a family in London and dedicated to the care of Muslim orphans. It was well run and staffed by a combination of Muslim and CRS workers. There was a young man that was of special concern due to his unique traumatic experiences and I had been brought there to treat him. I exchanged a few friendly words in Arabic, the only ones I know, and the effort seemed to ease the tension in the room. I treated the young man, a street boy, for three traumas and he seemed much better. The young man had endured great suffering and I was so pleased that TFT was able to help him. The next orphanage we visited was a well-run Catholic orphanage that took in children of all faiths. They had cows for milk and chickens and turkeys and a garden and a fishpond that farmed tilapia. But they had a limit to the number of children they could care for full time. I was asked to treat two street children that were given school uniforms to wear and hot meals whenever they could make it to the Center. However these children have no means to attend school. Back home, my hair stylist and friend, Jeff Nigelski, who doesn’t accept tips, had his clients donate money to a fund for these two older children. The money already collected will send both children to school for one year. Gabriel Constans and his wife Audrey and their son Shona were trip documentarians par excellence. They took lots of pictures, video, and audio and helped the medical team. Besides assisting me with the CRS training, Gabrielle spent a day treating formerly untreated orphans who had been identified by the medical team as needing psychological help. Tim Botsko and his wife Paula helped with everything and I mean everything! We could not have coordinated our many activities without their help. Tim ran certificates for the first algorithm training, got training materials printed in French and English in unbelievably difficult circumstances and brought training attendees bottled water. Tim also met with a local Kigali architect and began plans for the new orphanage building planned for next year and funded by Christ Lutheran Church. There are many more stories and adventures to tell but I hope this gives everyone who is interested a bit of feedback about what this jointly sponsored ATFT Foundation/ Christ Lutheran Church mission was all about. Upon reflection, our team accomplished a great deal of good during our short stay in Rwanda. I am reminded of a quote from Helen Keller that I use in my trainings. “Life is full of suffering but it is full also of the overcoming of it.” The purpose of TFT, at one level, may be to eliminate perturbations in the thought field but at an even deeper level, I believe this quote even better reflects what TFT is really all about. On the way back home I read William Easterly’s book, The White Man’s Burden, chosen as Best Book of the Year by the Economist, Financial Times and Washington Post. Easterly, an economist details why foreign aid, with some notable exceptions, doesn’t work. He supports a bottom up model of foreign aid rather than the usual top down where the aid dollars don’t usually filter down to the people who need it most. It was satisfying to know, after reading his book, that our team is utilizing the foreign aid model that research demonstrates to be most effective. We have tried to be a catalyst for change but the Rwandan people will be the ones that in the long run will make a difference. In the preface to the book Rwanda: Towards Reconciliation, Good Government and Development, it is explained that Rwandan President, Paul Kagame, “believes that development can only be indigenous; it cannot be imposed even by well wishers.” The work we began with the help of our Rwandan friends has been left in the capable hands of the many Rwandans we met along the way. As I boarded the plane and headed for home, the guard’s words continued to ring in my ears “Thank you for your services.” His words hold true for all who had a part in making this trip possible. The Medical Team, the Training Team, the Treatment Team, the Research Team and those of you who contributed financially and/ or with your good wishes and prayers.